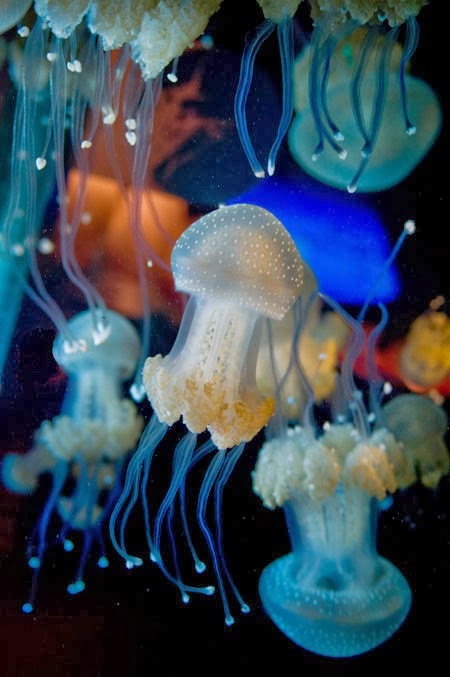 There is a lot to enjoy at the New England Aquarium—from graceful sea jellies and charming penguins to educator talks, from hands-on touch tanks to the four-story Caribbean reef inside the Giant Ocean Tank. We are committed to creating an accessible, inclusive experience so everyone can enjoy all we have to offer. Visitors using wheelchairs and visitors with visual impairments have free admission. American Sign Language interpreters are available every first Sunday of the month from 12:30 –4:30 p.m. Assisted listening devices are available at the IMAX and Info desk. Closed-caption Blue Impact tour is available for free download to hand-held media players. Groups of visitors with hearing impairments can arrange special guided tours or arrange for an ASL interpreter. Wheelchair-accessible amenities include elevators, restrooms, ticket window and IMAX viewing spaces. Aquarium wheelchairs are available upon request. Several Aquarium exhibits include hands-on tactile elements, colorful graphics and large print. 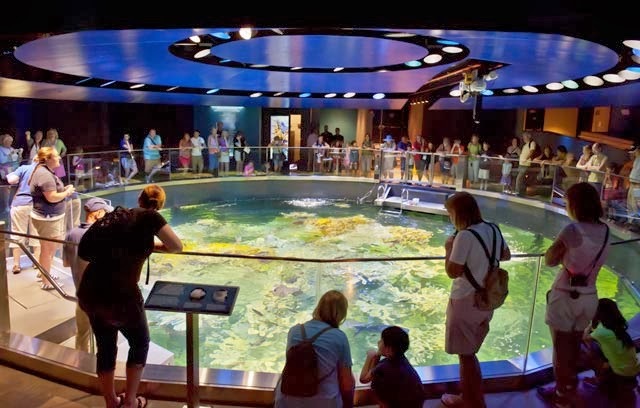 Visitors with hearing impairments also benefit from description panels throughout the Aquarium. These panels include exhibit descriptions, species identification, discussions of conservation issues and much more. Many of the descriptive panels include photographs or diagrams as well as text. 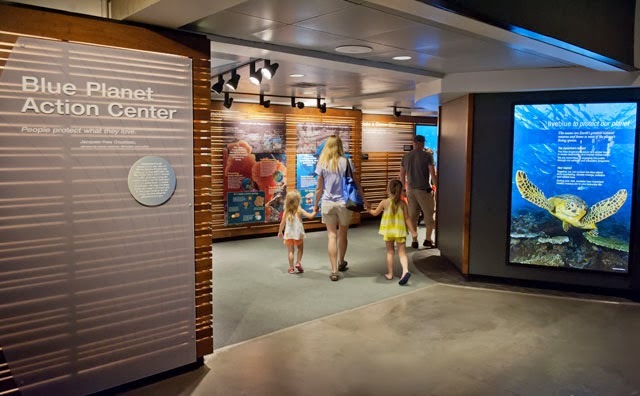 Many Aquarium exhibits incorporate elements that are helpful to visitors with visual impairments, such as oversized typefaces, bold illustrations and colorful graphics. Visitor drop-off and pickup is allowed at the Aquarium’s main entrance. There is one automated doorway (enter from the front plaza). If you take public transportation—it's one way to live blue™ after all—the Aquarium is only 237 yards away from the MBTA Aquarium Station (on the Blue Line). An elevator provides wheelchair access to the Aquarium station and platforms. 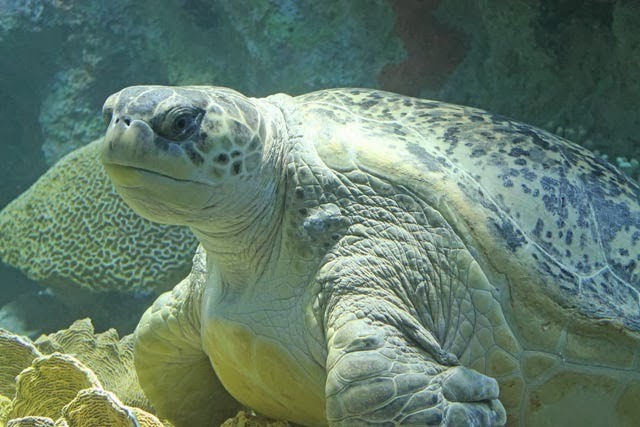 Learn more about accessibility at the Aquarium. Another helpful resource for visitors is our Frequently Asked Questions. With the weekend here, it's time to plan a visit. You can buy tickets online! We hope to see you here on Central Wharf because there's something for everyone at the Aquarium! Thanks to Guénaëlle Maria for helping prepare this information.